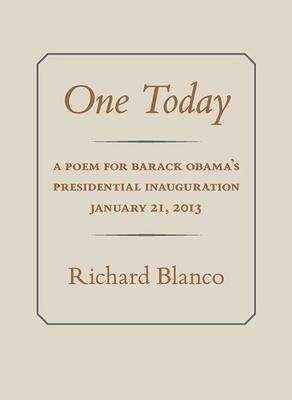 One Today is a commemorative chapbook of Richard Blanco's inaugural poem, presented January 21, 2013 during President Barack Obama's inauguration ceremony. "Blanco's contributions to the fields of poetry and the arts have already paved a path forward for future generations of writers. Richard's writing will be wonderfully fitting for an inaugural that will celebrate the strength of the American people and our nation's great diversity." --President Barack Obama "Blanco showed great courage . . . and it's courage that is the most important of all virtues because without courage, you can't practice any other virtue consistently." Richard Blanco was selected as the 2013 inaugural poet by President Barack Obama. He is the author of three poetry collections: Directions to The Beach of the Dead,winner of the PEN/Beyond Margins Award; City of a Hundred Fires, winner of the Agnes Lynch Starrett Poetry Prize, and Looking for The Gulf Motel. Exploring themes of Latino identity and place, his poems have appeared in Best American Poetry 2000 and Best American Prose Poems and have been featured on NPR. Blanco is a fellow of the Bread Loaf Writers Conference, recipient of two Florida Artist Fellowships, and has taught at Georgetown and American universities. A builder of cities and poems, Blanco is also a professional civil engineer.